I think it's fairly well known that the best time to hit Ebay for concert tickets is at the last minute when desperation has set in on the part of the seller who needs to make a sale but has probably got a limited field of truly motivated buyers since most dedicated fans get their tickets well in advance. We already had tickets for one show but had heard about so many people attending multiple shows (I know one guy in California who's seeing them three nights in a row) that we decided to take advantage of their two night stint in Dallas. 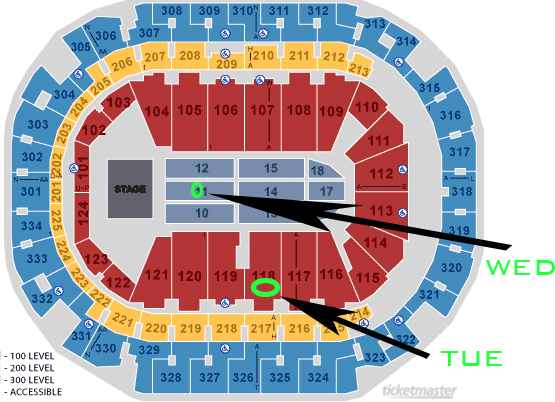 We had good floor seats for Wednesday, so we figured we could get some less premium seats for Tuesday which would make the second show still something to look forward to. Part of this rationale is also based on this potentially being the last time we'll ever see them (it's been over twenty years between shows already). Since tonight was the last realistic night to get tickets that could be mailed fast enough to reach the buyer in time to make the show, I figured it was worth a look. And yes, there were several good options available, and we managed to get two tickets in the lower stands at half the box office price. Ebay can take away, but sometimes it gives. All I know is I am going to triple the number of times I have seen the Police live, and I never thought I'd be able to say that. I've heard very positive reviews from the other longtime fans who have seen the most recent shows, so I'm stoked to say the least.